A growing battle is looming, and the combination of Spider-Men from different Earths are joining forces in the new Spider-Geddon #0. Peter Parker of Earth 1048, is out doing his daily superhero duties, when he comes across a dangerous new villain. The Tarantula has robbed a bank, and in battling the villain, Parker meets another Spider-Man. The Superior Spider-Man of Earth 616 has come for help. 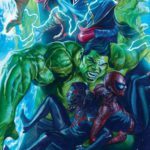 Together they battle the Tarantula, arrest him and Parker learns the truth about why Spider-Man of Earth 616 has come to find him. Parker learns that his counterpart is Otto Octavius and he needs Parker’s help. 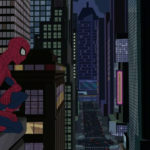 The Inheritors are destroying his planet Earth, and Octavius needs as many Spider-Men as possible for the coming battle. Peter Parker is always willing to help and agrees to travel across the dimensions to fight. Prior to leaving he seeks out Miles Morales and tells him that he will be gone and that Morales should look after everything and be willing to get involved to help protect the city. A final goodbye to his girlfriend MJ and the two Spider-Men set out to cross dimensions. A throwaway villain like the Tarantula is nothing to write home about, but Spider-Geddon #0 is an enjoyable comic which sets the ground for a thrilling series to come. The infinite universes with the multiple Earths is a great arc to throw a curve ball at characters and long-held narratives. In Peter Parker’s world, Otto Octavius is a mentor who went bad and is currently serving time in prison for his crimes. On Earth 616, Otto Octavius is the hero. Everything that Peter Parker saw in him, the virtue and good that was ultimately crushed by Octavius and his ambition is seen to fruition. Imagine if you find out that the person you believed in, but who also let you down and lied to you, is a hero and a good person in another life. This is what Parker is seeing when he meets the Superior Spider-Man of Earth 616. 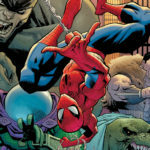 Not every comic starts off with a bang or an epic brawl on the streets of New York, and for Spider-Geddon #0 we see the human side for the whole comic. Writer Christos Gage has taken the opportunity to remind us that Peter Parker is much more like us, then most super heroes. Yes, he is intelligent and incredibly talented and strong, but he also worries about mundane things like the rest of us. He cares about MJ, so much so that even when he is going to leave to do battle in another dimension, he takes time to say goodbye. His affection for Miles Morales is touching. The two characters fill the teacher/student role, with Parker acting as mentor to the young Morales. When he leaves, Parker meets with Morales because he wants to say goodbye, but also in a way wants to pass the torch to Morales. Parker is trusting him and wants Morales to know that he believes in him. It’s time for Miles Morales to be Spider-Man too. 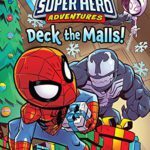 As the comic closes the quippy remarks from Parker, and the disdain that Octavius has is funny, and lets readers know that though Parker is going off to battle in a distant dimension, he still has a sense a humor. Things may look grim, but that’s not going to stop Peter Parker from making quippy comments. I give Spider-Geddon #0 3 web bombs out of 4. Peter Parker is his usual funny self, Octavius in the form of Superior Spider-Man is a perfect foil to Parker, and they should make a great team in the coming comics. I would have like to see more of Octavius on his Earth, before he went searching for help. We get a hint of what life is like and how bad the Inheritors are, but I would l have preferred to see Octavius has some role on his own world, even if it was only for a page or two. Spider-Geddon #0 is a great story and has set up readers for an exciting series. 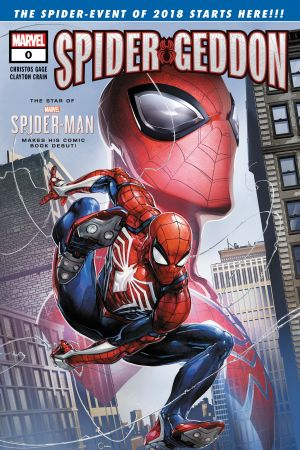 With a title like Spider-Geddon, how could any fan of Spider-Man not want to read it. I know I will.